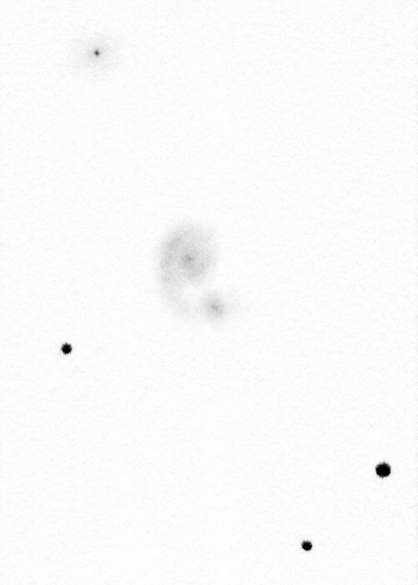 NGC 5278-79 drawing inverted into positive. 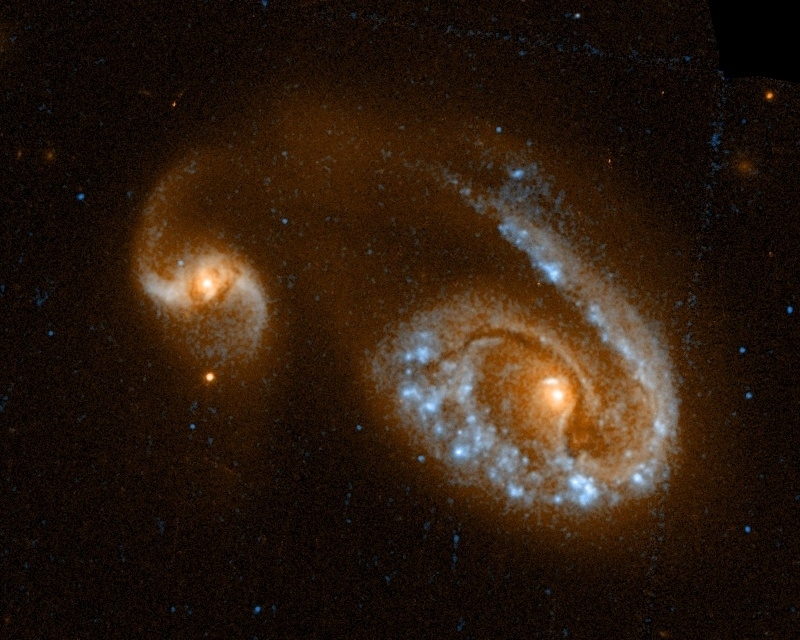 The interacting pair of galaxies Arp 239 lies about 300 million light years away. Therefore it seems to be pretty small in the telescope. The whole system is about 65"x40" (arcseconds). 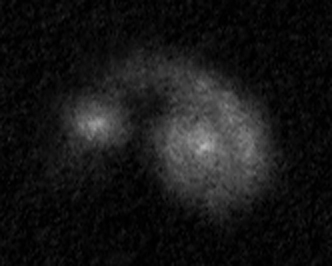 None of the galaxies are really faint and surprisingly the system reveals many details. NGC 5278 is the greater galaxy (up). 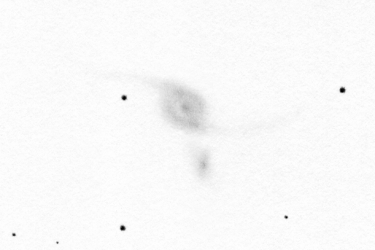 Its spiral structure is relatively easy to spot in the telescope. 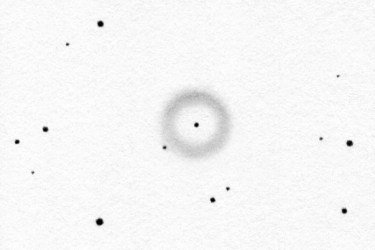 It seems to be a little inhomogenious an two bright spots can be identified inside the spiral arm. The smaller galaxy is NGC 5279 (down). Is is slighty fainter but a little inhomogenious just like its companion. 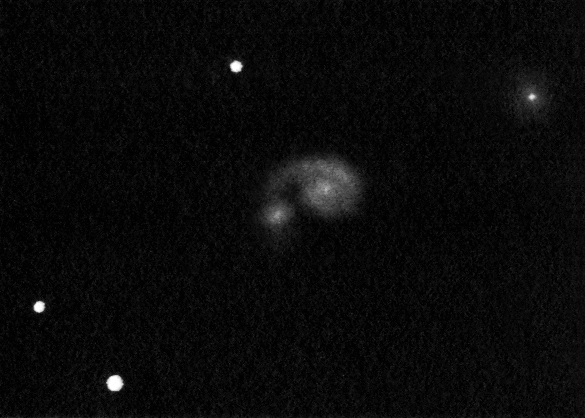 The spiral structure is not visible in NGC 5279 - it only seems to be elongated. 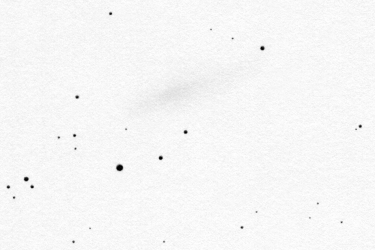 Both galaxes harbour a small and faint core. The spiral arms connecting the components is clearly visible. 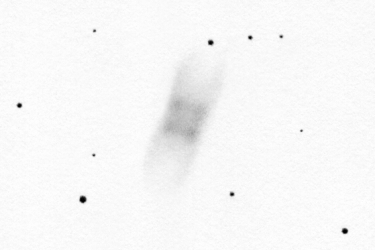 It goes a little behind NGC 5279 as a very faint extension (?). 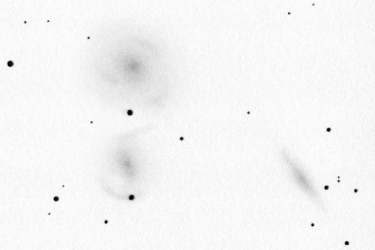 Another interesting galaxy is present in the field: UGC 8671 (left at the very top). It has a completely stellar core which is surrounded by a very faint halo. At first I haven't even noticed it. You can see the Hubble image of Arp 239 to the left. I rotated and cropped my inverted drawing to show about the same area of the sky. This crop is very small, about 2' (arcminutes) across. The physical size of the drawing is very small as well (this crop is about 0.6 inches). 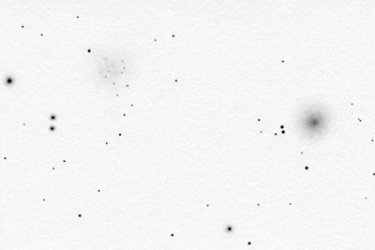 Therefore the unequalities of the paper and the noise of the scanning is very much visible. Surprisingly the 16" telescope revealed quite many details. It was a joy to see this system with my own eyes.